In the last couple of Weeping Tile interviews I've read, the interviewer was either waiting at a bitter cold train station in Kingston or winding their way through brilliant autumn foliage. I of course didn't receive my expense budget to rent a pink Cadillac and drive to Toronto to do this interview. (Mr. Editor's gonna get a talkin' to, rest assured.) Instead, I am sitting at home on the first truly hot, sunny day this year sipping on lemon-lime Kool Aid waiting for the phone to ring. Not very Canadiana of me, I suppose. I say this because it is a term you hear a lot when Canadian artists are mentioned (by me as well), and Weeping Tile is one of those bands unable to find shelter from this blatant categorization. 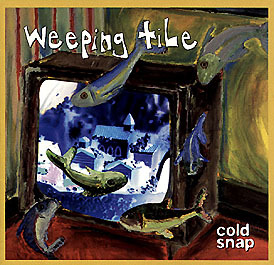 Hailing from the musical hotbed of Kingston, Ontario, home to such swingers as Dan Ackroyd and the Tragically Hip, Weeping Tile has been touring North America in support of their current release, entitled Cold Snap. It has however, been anything but a rigid "cold snap" for the band over the last couple of years. In that time they have inked a deal with Warner Music and released their record south of the border. They have been in America for the past month with the Watchmen and today they are in Toronto, for the first Canadian show of the tour. 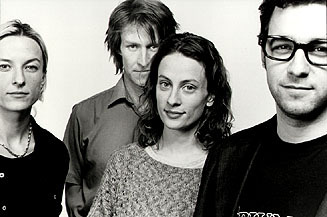 Sarah Harmer says it's good to back in Canada: "It's not as scary, there's not as many people packing guns up here." Which brings us back to that Canadiana thing: You will find Canadian references in Cold Snap, most notably, the track "Westray," about the aftermath of the east coast mining tragedy. Sarah's songs have been described as "winding their way through the Canadian Shield." After listening to Cold Snap, it appears to me that that means Sarah exudes her environment and paints intricate images for the listener. You can feel the emotion in her songs. 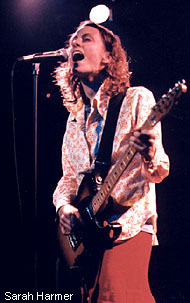 I don't, however, think that being Canadian is what brings out the compassion and emotion in Weeping Tile's music. It is simply their nature and they keep it close to home. We've gone the Super 8 [a budget motel chain] route and they've been good. The only differences between them and nicer hotels are that the beds are a bit longer and you get to keep the conditioner and stuff." I asked Sarah if they had plans to headline their own tour in the near future. Her voice perks up with sheer excitement and I can just picture her eyeballs ready to explode out of their sockets. "YAH!... Weeping Tile on their own... not on the coat tails of the other bands we've played with... it'll be nice we'll get to play an hour and a half (instead of the 45 minute max set) and get a decent sound check." It looks as though they are planning to headline their own tour late September or early October. I'm almost as excited as they are! Why, you ask? I've been fortunate enough to see Weeping Tile perform a handful of times and they have always been great. The instant I heard Sarah sing at Ultrasound in Toronto I was in love with her voice. The emotional paintings threading through Cold Snap are translated clearly through the live show, which also brings out a rockier edge to the band's performance, giving the music that extra punch and appeal. It seems to be catching on. When they opened for the Bourbons last year, there weren't many people at the front of the stage, but at the Skydiggers show months later, the front area was filled with a number of people seemingly familiar with their material. The upcoming June 7th show with the Watchmen at the Commodore should prove to be equally as successful. Finding that successful chemistry is never an easy task, and is something that can't be forced - it manages to find its way through time and persistence. Weeping Tile found this chemistry close to home. 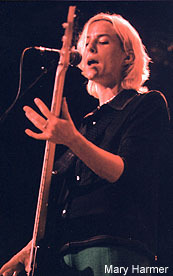 Sarah is the sole original member of Weeping Tile. Her sister Mary moved back to Kingston from the west coast, where she spent a good part of her time living on Saltspring Island. Isn't that backwards? I thought everybody moved to the west coast, not away from it. Anyway, she was just learning how to play bass and she moved to Kingston to join the band. Sarah tries to recall it: "She was just starting to play bass and she moved out... she had a bass... actually I sold a guitar and bought a bass and she picked up a rig and away we went... and now she's a virtuoso." Luther Wright and new kid on the skins Cam Giroux make up the other half of Weeping Tile. The rest is history as it were. Back to the future! After their current tour with the Watchmen, Weeping Tile will be performing throughout Southern Ontario before cherishing a couple of months off in the summer. They then hit the road again, but this time as Weeping Tile: Out On Their Own. Sarah didn't have a clear idea of when a new album may be recorded. "When the songs are ready... I find it tough to write on the road, I usually write when there's nobody around... I have some lyrics and we have some songs half-worked out... " Maybe Sarah will get a chance to do some writing in the winter, as she says there's not much happening outside. Obviously she doesn't play hockey (how Uncanadiana of her), but we'll let that slide. There's no rush, however, for a new CD as Cold Snap is being spinned many a time in many a CD player. Aah, I'm out of Kool-Aid. That's okay, I've got to go to the library anyway. You know, forget Kerouac and Dr. Thompson, this isn't America, go enlighten yourself with some Mordecai Richler, Leonard Cohen or even Emily Carr, and really do yourself a favour by catching Weeping Tile at the Commodore. I'll see you at the show!